Blogging is a combination of science and art. The science part requires that bloggers use the latest search-engine-optimization tactics. The art is to hone writing and editing skills. But it doesn’t have to be as difficult as that may sound. As a longtime blogger and journalist, I’ve learned what works for me, and what does not. Based on my experience, here are nine suggestions to help you become a better business blogger. What makes a blog unique has less to do with technology and more to do with personality. What sets blogging apart is that it gives the author a platform from which to inform, instruct, inspire or incite. Not only that, the reader forms a relationship with that person, albeit a virtual one. Even if you are writing on a company blog, identify yourself as the blogger by name, not as the “admin.” If possible, include your photo to make it even more personal. The best blogs are those that are written with the reader in mind. There is a fine line between blogging on topics about which you are passionate and writing for your audience. Arguments could be made for both. After all, if you write feverishly about a topic of great interest to you, chances are you will build an audience of those who share that same interest. Still, I believe bloggers have a responsibility to use their voices responsibly, emphasizing the needs of readers. Write to educate and serve. Make sure to inform readers more than just the products. Include industry news and trends as it relates to your customers, which will build trust. Focus on your audience. The purpose of your blog is to provide potential customers with information they need about a product. It’s one of the few places on your website that is actually for web visitors and not for the company. The types of posts that make great educational content include “how-tos,” or list-style posts such as “10 things you need to know…” or “Five secrets to…” These types of posts are popular with readers because they are educational. If you are using a blog for marketing purposes, especially for search engine optimization, it’s best to focus on an individual topic. My favorite example of this principle is a blog about single-serve coffee. 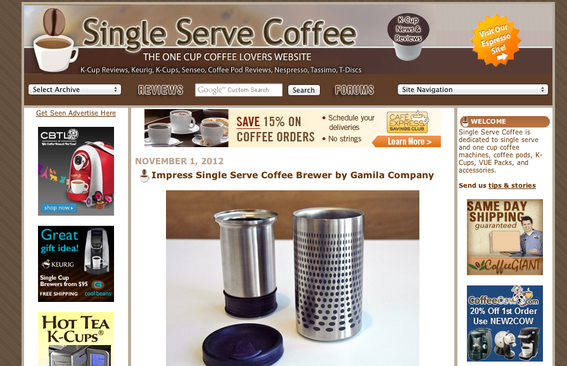 If you use Google, search the term “single serve coffee.” Chances are that the top result is SingleServeCoffee.com, which is a blog that talks exclusively about single serve coffee, coffee makers, and other items related to that topic. The Single Serve Coffee blog focuses on that narrow topic. It’s highly ranked in search engines. In addition, do not try to do much with a single post, such as optimize for multiple keywords or cover several different topics at once. Keep each post to one topic, and one keyword. Search engines are more likely to highly rank blog posts that go in-depth on one topic, and provide authoritative content to web visitors. Choosing the right blogging platform is important. Let me explain. Twitter is commonly referred to as a “micro-blog” in that its posts are limited to 140 characters. Conversely, WordPress, Typepad, and other blog platforms are well suited to long-form blogging. But, what if you want to write posts that retain the anecdotal character of Twitter, but not be constrained by character limits? You might consider Tumblr, in that case. It is a blogging platform that has carved a niche for itself in micro-blogging — but not in the Twitter sense. Don’t write a blog post just to keep up a quota. Make the content noteworthy and worth the reader’s time and attention. If you use email for marketing, put a sign-up form for your email newsletter on the blog. Conversely, link to and promote your blog in the newsletter. Maximize the synergy that exists between the two, to foster the prospect of gaining even more attention from the reader than you could through one channel alone. In addition, spread blog post content to your target audience on social networks. Do not duplicate content from another blog or website as that may be considered to be plagiarism. Also, don’t post the same blog post in several places. Something that many bloggers struggle with is publishing on a schedule. No matter your role in your company, blogging is likely not your full-time job. Consistent publishing takes discipline and time. The first can be learned, but the second has to be found. One way to address time is to remain at least one post ahead. If you publish weekly, make sure next week’s post is written before you publish this week’s. This is more difficult if your posts draw on current news, but this is a good reason to have a variety of post types. If you are using a blog for marketing purposes, you should be blogging no less than two times per week. If you can blog more frequently, and still maintain a high quality in every single piece you write, do it. The reason business blogging needs to be frequent is because it keeps readers — and search engines — coming back. No one is going to come back to a blog that only publishes once a month or every other week. If you write compelling content that brings your audience back for more, they are likely to leave comments and link to your post from their own blog or social networking sites. Continue these conversations in the comments. Every real comment should get a real response. It makes a difference to readers to see the post authors responding in the comments. And when you find your content shared by your readers elsewhere, thank them and continue the discussion over there. Being appreciative of comments goes a long way. No matter which blog platform you choose, I encourage you to start blogging. Blogs are the forerunners of social media and some consider them to be antiquated and out of style. But blogs can help you or your company in a way that social media cannot, especially for search engine optimization.